Everybody dies. This is a universal fact. Also true everywhere is the fact that after death something has to be done with the remains. Usually the passing of a person is marked with some type of ceremony. In the USA we are quite familiar with these processes – mortuaries, memorial services, funerals, graveside services, cremation, etc. The ceremonies are often religious – Christian, Jewish, Muslim, or whatever; and some not religious at all — but they are usually ceremonial. All of these activities have everything to do with the deceased, but the decisions have nothing to do with the deceased, they are all made by the next of kin. In Botswana the next of kin is usually the spouse, but often it is a parent, uncle or grandparent. 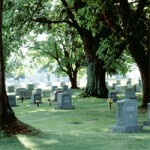 In the USA some graveyards are quite obviously populated by (formerly) wealthy people. The graves are well tended, with not a weed to be seen. The headstones are large and grand, with a lot of writing carved into them. It seems that in the USA the graves, even in the most average of cemeteries, in the most average of places, all have a nice headstone and the grounds are well tended. Of course, some people are cremated and their ashes are scattered here or there, but the remains (or “cremains” I am told is the correct word now) of most of them are kept somewhere nice. Usually the cremains find themselves settled in the dark at the bottom of a pretty container (called a “cremation urn”), which is itself locked up tight in a small (approx 12” x 12” x 12”), dark niche in a mausoleum or columbarium. According to his wishes, one of my relatives had his ashes scattered over Lake Lanier, North of Atlanta, where he spent many enjoyable hours boating. Some of his relatives up north resented being left out and insisted that half of his ashes be scattered near the graves of his parents in New Jersey. So even after death, this guy was pulled (literally) in half by relatives competing for his attention. Some people have been pretty creative with their ashes. I heard the cremains of Timothy Leary were shot into space. In fact there have been about 150 people’s remains shot into space according to Wikipedia. The Rolling Stones guitarist, Keith Richardson, known as much for his drug escapades as for his music, is famously quoted as claiming to have “snorted” some of his father’s ashes (he later denied it, and then still later admitted it). It is fairly common in the skydiving community for the ashes of a departed fellow skydiver to be taken on one last skydive with his friends. We call it an “ash dive”. Usually the remains are placed in a special container with a Velcro opener. 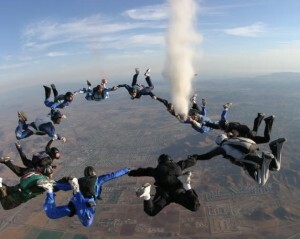 A group of skydivers who knew the deceased will jump together and fly with their departed friend one last time. When it is time to open the container the 120 mph breeze instantly empties the container. From the ground it looks just like a small cloud appears, which seems fitting and is pretty to see. If you search You-Tube for “ash dive” you can watch one. As long as we are on this grim topic, I highly recommend a book on the subject: Stiff, by Mary Roach. 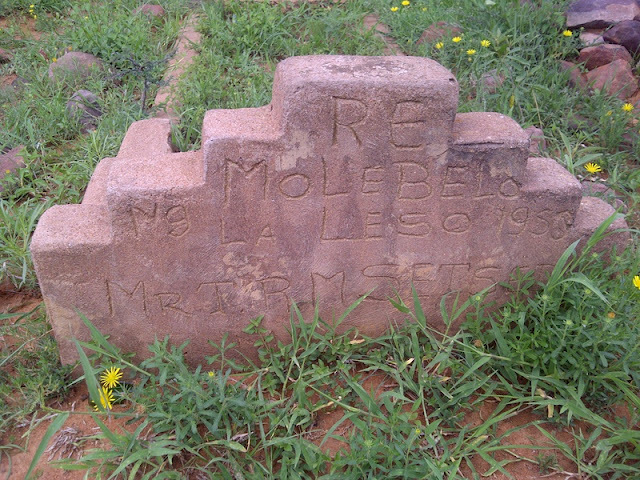 In the average cemetery in Botswana headstones are not common. 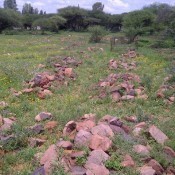 The grave is marked by rocks which are heaped up in a pile. 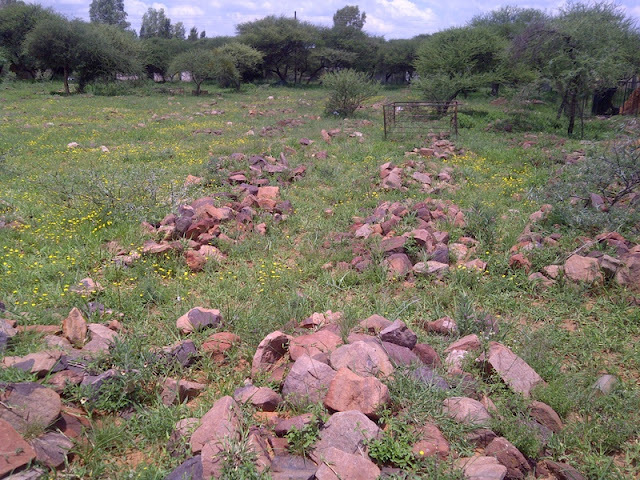 Older graves are only distinguishable by these same rocks, now not piled so high, with grass growing up through them. 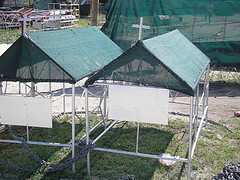 Some graves have the remains of a wire structure with cloth on the top. Sometimes the “roof” is flat, sometimes peaked. The “roof”shields the grave from the sun. When I first saw these “shelters” over the graves I assumed it had something to do with keeping rain off the newly turned earth. I asked a co-worker about it and was told that the shelters were there because it was thought the deceased would appreciate the relief from the sun (maybe in life they carried an umbrella). I saw the cemetery in Mochudi the other day. I thought it was just a rocky field, until I saw a two headstones, and a few grave shelters. In the entire cemetery there were only two headstones. One was handmade and roughly carved, the other one liked like something you would find in America. Just like in America except for the two goats who were laying on the grave in the shade of the shelter. In Botswana, in some areas it is not unheard of to bury someone underneath the floor of your house. I am told this is routine for deceased children below the age of one. In this unhappy event, family members will get the pickaxe and shovel and dig down through the tile, through the cement beneath, and dig a grave in the dirt under the cement floor of the house. Then the grave is covered, the floor is replaced, and life goes on above the little grave. I have not been to a funeral here, but am told the week leading up to it is pretty gruelling. The family of the deceased hosts people for a whole week (at great expense sometimes). People come and pray with the family for hour after hour, throughout the day and night. The funeral is always on a Sunday. The Saturday before that appointed Sunday, the body is brought back to the family home from the mortuary and stays one last night at home, surrounded by family and friends gathered for one last night of marathon praying. The Sunday of the funeral involves a procession to the graveyard where the grave has been dug using hand tools, by relatives. At the graveside hymns are sung, some words are spoken, the grave is covered with earth and a heaping pile of rocks, and that is that. This entry was posted in Peace Corps, Service - Year 1 and tagged Botswana, Burial, Cremation, Death, Mobley, Peace Corps. Bookmark the permalink. Thank you for posting this information about the gravesites. We were watching an HBO program entitled The No. 1 Ladies’ Detective Agency and it had a scene in a graveyard. Your post was most helpful in understanding why the canvas roofs were everywhere.